Photo – BoxNation – Four-Fight Card Will Stream Live Exclusively To U.S. Audience This Saturday From London. WHAT: IBF Super Middleweight World Champion James DeGale (23-1-1, 14 KOs) and IBF Featherweight World Champion Lee Selby (20-1, 9 KOs) weighed in today ahead of their respective bouts against Caleb Truax and Eduardo Ramirez that will stream live on SHOWTIME Sports’ YouTube and Facebook channels this Saturday. The four-fight card from Copper Box Arena in London will begin at approximately 2:45 p.m. ET/11:45 a.m. PT. Also on Saturday’s live stream, undefeated light heavyweight Anthony Yarde (13-0, 12 KOs) will face former world title challenger Nikola Sjekola (32-4-1, 11 KOs), and heavyweight prospect Daniel Dubois (5-0, 5 KOs) will take on former Anthony Joshua challenger Dorian Darch (12-5-1, 1 KOs). SHOWTIME Sports will live stream a world-class boxing event – including two world championship bouts – free to the U.S. audience on social media platforms Saturday, December 9 to close out the network’s industry-leading 2017 boxing schedule. The digital-only offering will be exclusive in the U.S. on the SHOWTIME Sports YouTube channel and the SHOWTIME Boxing Facebook page. 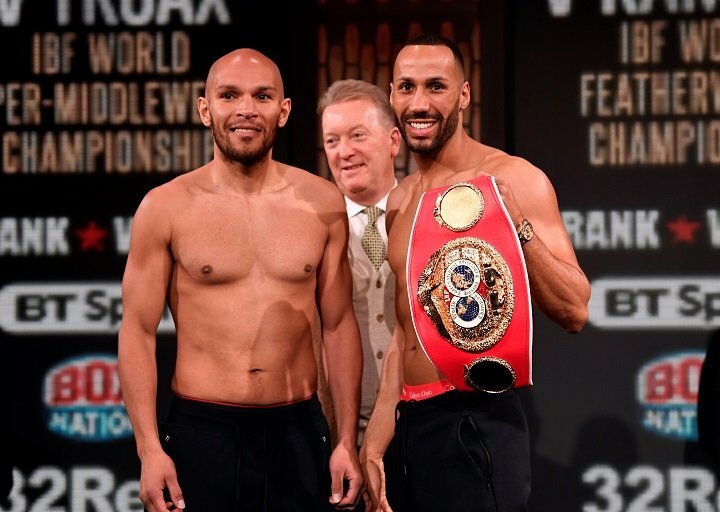 IBF Super Middleweight World Champion James DeGale (23-1-1, 14 KOs) will headline as he defends his title against former world title challenger Caleb Truax (28-3-2, 18 KOs) in DeGale’s first fight since a thrilling bout with Badou Jack in a 168-pound world championship unification match last January on SHOWTIME. In the streaming co-feature, IBF Featherweight World Champion Lee Selby (20-1, 9 KOs) will take on undefeated contender Eduardo Ramirez (20-0-3, 7 KOs), while undefeated light heavyweight Anthony Yarde (13-0, 12 KOs) will face former world title challenger Nikola Sjekloca (32-4-1, 11 KOs). The opening fight of the live stream will feature the U.S. introduction to 20-year-old undefeated heavyweight Daniel Dubois (5-0, 5 KOs) as he takes on former Anthony Joshua foe Dorian Darch (12-5-1, 1 KOs). Live coverage, provided by BoxNation and BT Sport, will begin at approximately 2:50 p.m. ET/11:50 a.m. PT with U.K. sportscasters John Rawling and Richie Woodhall calling all the action. In 2017, SHOWTIME was the first network to offer live boxing on Twitter with Adrien Broner vs. Adrian Granados (February 18). SHOWTIME also live streamed two other boxing events in 2017: super middleweights George Groves vs. Fedor Chudinov on May 27 and heavyweights Jarrell Miller vs. Gerald Washington on July 29. Next boxing news: Vasyl Lomachenko doesn’t just beat guys, he makes them quit, retire sat down – could Rigondeaux be next?